I had question, I heard questions so I tried to answer some of them. 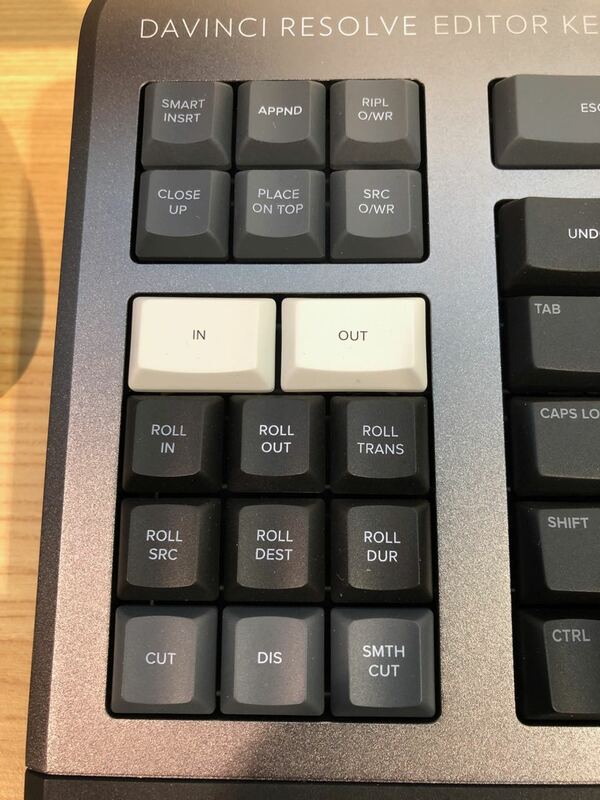 Let’s talk about the DaVinci Resolve Editor Keyboard. 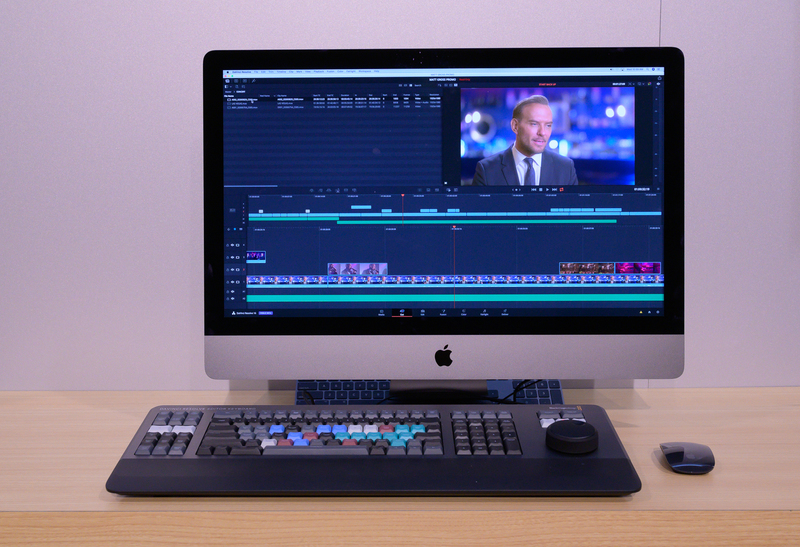 It was a big surprise at NAB 2019 because let’s be honest, editors don’t often get hardware products dedicated to editing. 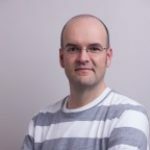 We get software out the wazoo, both big and small, but the time and expense to create a hardware device is probably much greater than many of the little software tools we get. And, let’s be honest again, there really isn’t very much hardware that an editor needs beyond the computer system running our NLE. Yes, there are Contour Shuttle Pros and computer gaming mice that are well-liked hardware devices and do a decent job or supplementing the editing experience. But for every Logitech Craft Keyboard with Crown that does add something positive to the editing experience, there’s the Loupedeck that detracts rather than enhances. The Editblog archives are littered with morphs and Roller Mice that while fun and useful, aren’t better than a keyboard and mouse. I had another chat with BMD’s Dan May about the keyboard. Enjoy. The Resolve Editor Keyboard is just that, a keyboard. By building a jog/shuttle dial into the design it’s more editor keyboard than any other keyboard (maybe event the legendary Bella) and adding dedicated editing buttons beyond the standard alphabet keys makes it even more for the editor. Thanks for thinking about us editors BMD. After various interviews with BMD President Dan May I had a play with the Resolve Editor Keyboard on camera. This split screen below (best viewed in full screen) takes you through a few of the functions to get an idea of how it works. 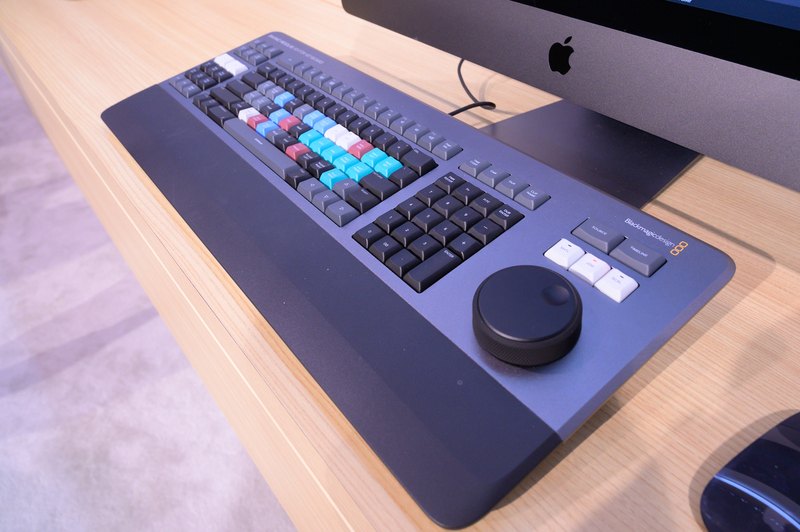 It’s worth noting that the Resolve Editor Keyboards that were on display at BMD’s booth were pre-production models and completed just days before the show. There will likely be some tweaks in the manufacturing as production ramps up en masse but for the most part, this is what it’ll look and feel like when it ships later this year. I played with it for a few minutes after the BMD press conference, a bit more the next day and then for two extended periods of time on Wednesday of the show. Yes, I neglected some other booths at the show to mess around on this keyboard. That’s how intrigued I became with the thing. Skeptical at first, I began to change my tune but the proof will be in the pudding when it’s used for multiple weeks on a big editing job. 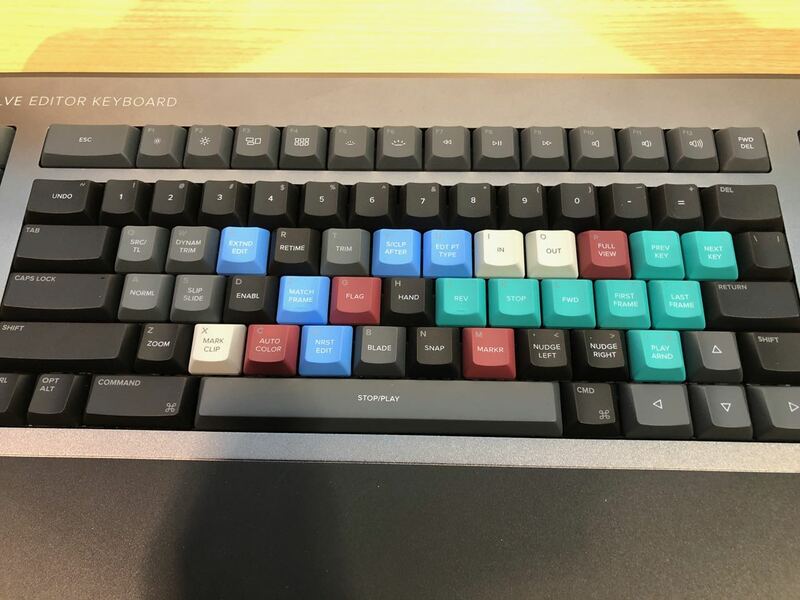 Below are some of the burning questions that I had about the Resolve Editor Keyboard, some question I had asked to me and others that I saw on social media. Some answers are my own observations, some I asked of folks at the BMD booth. Some are probably wrong. A lot bigger than your thin Apple chiclet keyboard. Not just the really small number-pad-less iMac models but the fancy-pants extended chiclet keyboard you got with your iMac Pro. A lot bigger. Will it fit on my desk then? Of course, it’ll fit on your desk unless you’re editing on something the size of an airplane tray table but if you’ve built your workstation around a tiny keyboard then get ready to adjust. I don’t know but the point was made during that keynote the wide lip at the top of the keyboard was designed that way to accommodate placing the keyboard in the recessed cutout of a desk. Kind of like you might have seen in a linear tape editing bay back in the day. Will people cut a hole in their desk to accommodate this design? Those keys look really big too. And hard to type on. That’s not a question but to reply … I thought the same thing when BMD CEO Grant Petty held it up at the press conference but I was pleasantly surprised when I laid fingers on it to feel that the keycaps aren’t just nicely designed but the whole typing feel is superb. The keypress travel is longer than a chicklet keyboard but the resistance is just enough and the longer travel actually might be a good thing for those that like a bit more tactile feedback while typing. There was a lot of thought put into the design of the keycaps and the mechanisms underneath the keys. I really enjoyed the feel. Is $995 for a keyboard expensive? This keyboard has a lot going on. Metal is used in the construction of the case so it looks and feels premium. 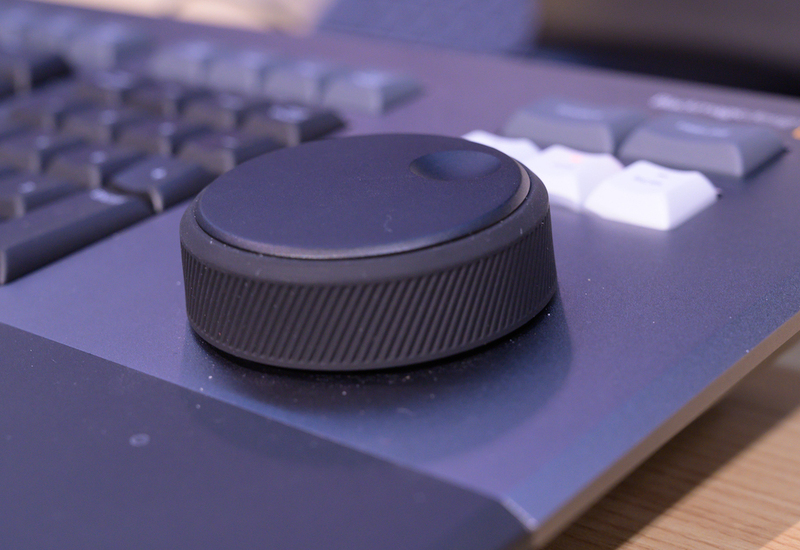 The rubber jog/shuttle/scroll wheel feels very good in your hand and has a clutch mechanism that changes from a smooth scroll to a click scroll depending on the function. That can’t be cheap to implement well. Add on the really good typing and you’ve got what I’m guessing are some big R & D costs and even bigger manufacturing costs. It’s also designed to last and last a long time. You’re not going to throw it away like you do a cheap chiclet keyboard when it starts to show age. Keycaps will be replaceable with the possibility of other parts being user replaceable. 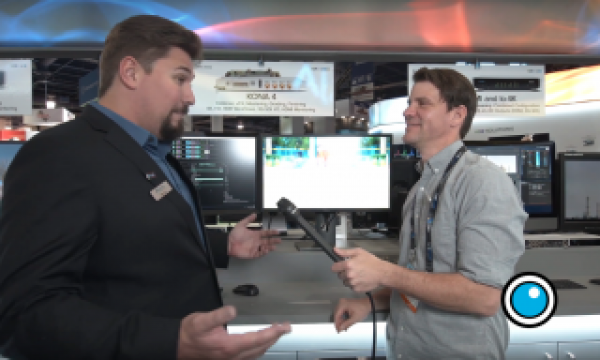 BMD produced a 2 hour + video called Blackmagic NAB 2019 Technical Product Overview and BMD CEO Grant Petty goes over a lot of this in the video. 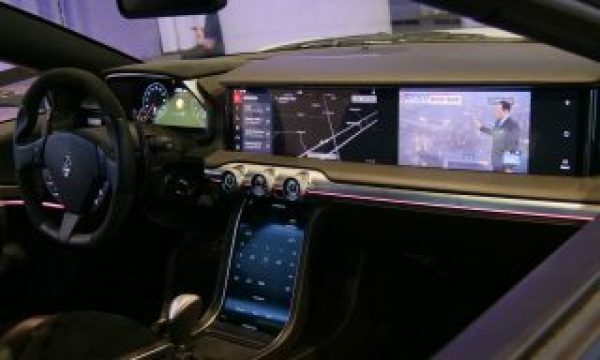 At 2:07 or so in the video BMD CEO Grant Petty says “there will be multiple models” and he mentions there will be a left-handed version (as a leftie I’d like that too!). That begs the question: Will there will be a cheaper version? He doesn’t specifically mention a more affordable version and it would seem that making it cheaper would remove some of the best parts of the keyboard like the feel of the jog/shuttle wheel. I heard it will only work on the new Resolve 16 Cut page? This is incorrect and quite a silly statement. Why would BMD spend money and sell a $1,000 editing keyboard when it only works on one of their two editing pages? Wait, Resolve now has TWO editing pages? Aren’t some of the actual keyboard keys based on the new Cut page? Not really I don’t think but looking at the edit keys on the upper left it might look that way. But all of my playing around yielded functional results on both the Cut page and the Edit page. These editing key shortcuts will be key to speedy editing in DaVinci Resolve. How does the jog/shuttle knob work? Like you would expect a jog/shuttle knob to work which, personally, I find of limited usefulness in a non-linear editor. But the Scroll button mode will zip the playhead up and down the timeline really quickly which is really nice. 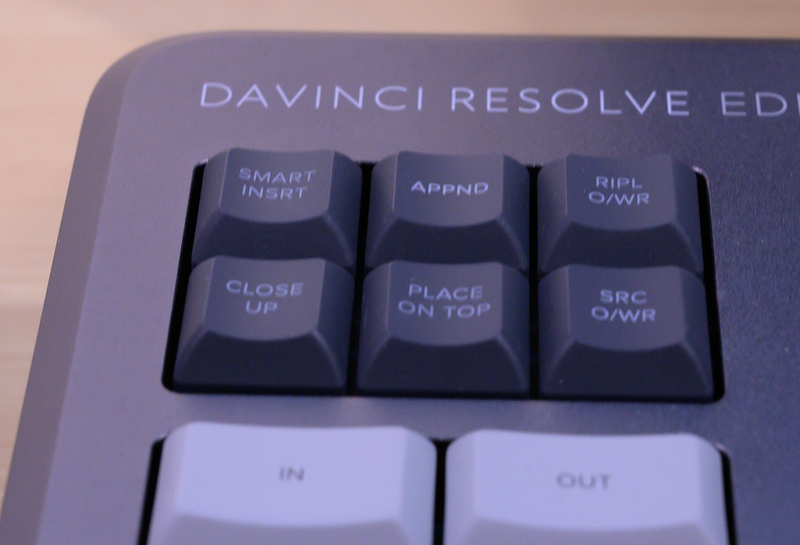 The wheel on the DaVinci Resolve Editor Keyboard is nice. It’s weighted really well and can be used with a full hand or just a finger. Can you change the function of the jog/shuttle wheel or remap any of the keys? Unknown at this point. I asked all of these things considering the relatively new visual Resolve keyboard mapper doesn’t have these different keys. Since the keys are hard labeled to things like CLIP NAME, RIPL O/WR (ripple overwrite) and SMTH CUT (smooth cut) my guess would be they will not be remappable. Wait, there’s a dedicated button for the SMOOTH CUT transition? Yes. There’s a dedicated button for the Smooth Cut transition that you won’t use very often and will actually try to avoid using at all costs as you want to cover your talking head edit with broll or a different angle. Double wait … what the hell is a “ripple overwrite”? For the uninitiated, it’s very cool 4 – point edit where you can overwrite clips of different lengths into an edit. It’s a nice keystroke saver. Where are the Home/End, Page Up/Page Down keys? 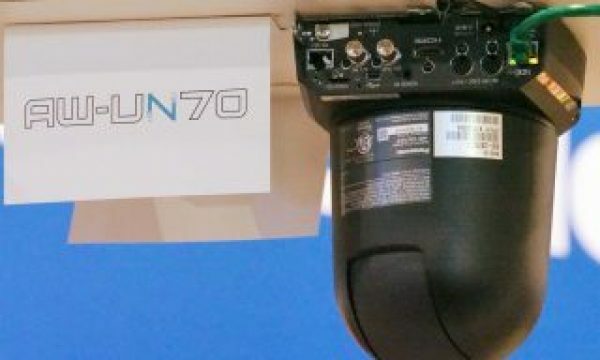 What are those six ROLL buttons on the left all about? Those are designed to work in context with the job/shuttle wheel (which I think could be called a trim wheel) as that is the highlight feature of the keyboard. Uhhh, how do they work? When you hold down ROLL IN, for example, Resolve will select the nearest incoming edit point and allow you to trim the cut by using the wheel. Hold down ROLL TRANS and you can perform a rolling “double roller” trim. Is this a better way to trim than using a mouse? Is this a better way to trim than using the keyboard shortcut, JKL and/or Dynamic Trimming? I have to say the skeptic in me was, well, skeptical but as I played with this new way of trimming I really liked it. It definitely had more of a feel than just repeatedly pressing buttons on the keyboard and that’s a lot of what editing is about; the feel. It’s probably not quite as nice as Avid’s legendary Dynamic Trimming but it’s something different that I hadn’t experienced before and the more I messed around with this method of trimming the more I enjoyed it. I was pleasantly surprised. 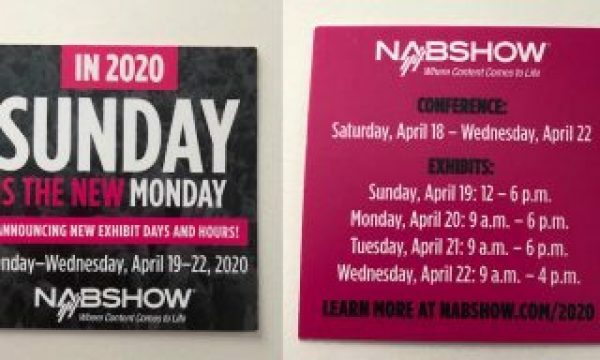 Now if you watch the BMD NAB 2019 video when Grant is working in the new Cut page with the new Source Tape feature you’ll see him making extensive use of the jog/shuttle wheel to move around a full stringout of his source media and marking IN/OUT points with the wheel. That looks like great fun and all but what he isn’t doing is actually playing the media back which, IMHO, is always the first choice. That has always been one of my criticisms of Final Cut Pro X’s skimming or Adobe Premiere Pro’s Hover Scrub (as much as I love them) in that they seem to discourage actually watching your source footage. They are great time savers in a time crunch but at what cost? Why do the six edit buttons on the top left not include the most common edits like Insert, Overwrite and Replace when they are used way more often than any others? My guess is because those standard edit types are already mapped to F keys by default and these different edit types are not. Then why aren’t those F keys printed with the edit functions instead of OS operations? Your guess is as good as mine on that one. Why are there big, dedicated IN and OUT keys on the left when the I and O already sets Ins and Outs? The idea behind keyboard-driven editing is to keep both hands on the keyboard so as you’re JKLing with your right hand your left can be doing the IN – OUT work. That’s why Avid Media Composer’s default setup has IN-OUT set to both i,o and e,r. Once you get into that two-handed keyboard method of working you can see its advantages. Are things like the Source Overwrite and Close Up edits innovative and amazing? Close Up is cool as it’ll create a 2x zoom on a clip at the same source timecode so if you’re faking multicam with 4K in a 1080 timeline that can be a big timesaver. The Source Overwrite will match a clip you edit into your timeline using source timecode to lay that in sync over a “base layer” clip already in the edit. That’s cool and could be a neat feature but it would seem it’s imperative you have matching, multicam-style timecode. That’s the holy grail of good multicam anyway and something that is often left behind these days. If you do have proper matching timecode you’d really want to use the multicam tools for your edit so you’d often already have these matching clips matched up on a multicam clip. If you do have matching timecode multicamera clips only take moments to set up and you always have the alternate angle there in the Edit page. These keys are all the Resolve EDITING keys so will this keyboard work with the Color page and the others tools in Resolve? yYes, of course, it’ll work on all the other pages in Resolve but it is the EDITING keyboard. Besides, BMD makes a number of other dedicated consoles for the different pages in Resolve. So you mean I could have a $995 editing keyboard, a $3,000 Mini panel and a $4,395 Fairlight Mixing Console all on the same system? I guess so. You’d have to be a really multitalented post-production pro to use them all well but you could also have them all in dedicated rooms of your facility as I don’t think BMD expects many people to rearrange their desks that often to swap out these big consoles. I doubt we’ll get an editing keyboard with these cool, LED screen buttons on the Fairlight mixing panel (kinda like the Optimus Popularis) but wouldn’t that be cool (and expensive like the Optimus Popularis)? Will this keyboard work with other NLEs besides DaVinci Resolve? Well, that will be sad. I agree as many of these keys built into the Resolve Editing Keyboard will have equivalent functions on other NLEs. And those that didn’t could be mapped to something new. Will that limit the market of the $995 Resolve Editing Keyboard? There are (currently) a lot more installs of Adobe Premiere Pro, Avid Media Composer and Final Cut Pro out there editing so you would think this could be a good market for a premium editing keyboard. Many working editors have multiple NLEs installed and I don’t see anyone spending that much for a keyboard and only using it part-time. But perhaps this is part of the Resolve strategy to make more inroads into the creative editorial space by offering a dedicated keyboard just for Resolve. Will someone hack this keyboard to work with other NLEs? I did see the creator of Command Post lurking around the BMD booth and giving the Resolve Editing Keyboard a play. Is there really a 2 hour + video from Blackmagic about the keyboard? As mentioned above there is a two hour BMD produced video but it isn’t just about the keyboard. There is also another BMD produced video about the keyboard. I laugh at how often the BMD videos mention “editing with two hands” as if that is something new and amazing. Professional editors have long known the value of editing with two hands on the keyboard and the Media Composer keyboard was build from day one to keep two hands on the keyboard. Some of this has been lost over the years but you can still edit with two hands on a regular keyboard in most all the NLEs. You just have to learn the keyboard shortcuts to do it. 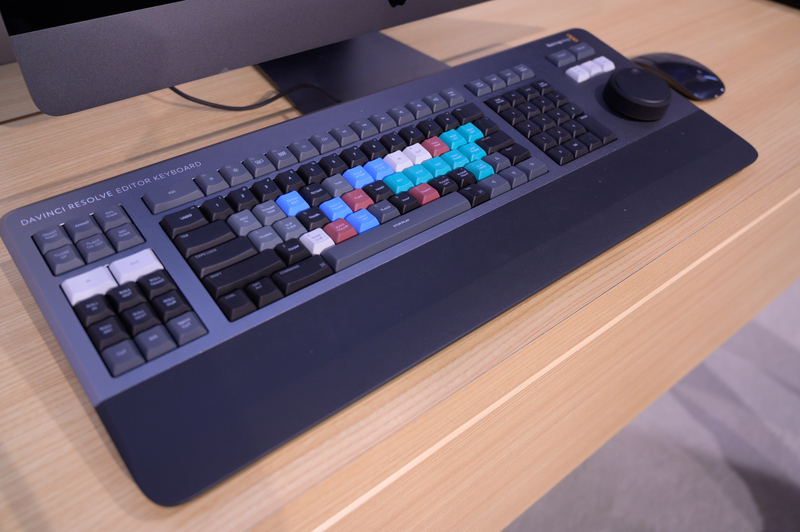 If you watch the two hour Blackmagic NAB 2019 Technical Product Overview you can see a much more detailed look at the Editors Keyboard by BMD CEO Grant Petty. One thing he mentions in the video is that for the six “roll” trim buttons on the left there is some internal debate about what they should call those buttons. Should they be labeled as the more traditional functions that they actually do or does calling them some variation of “roll” better indicate they are made for trimming? For example, Roll Source is actually a SLIP trim. I’ll go on record stating that these buttons should be labeled as to what the actual function is. We went through Apple deciding it should change the names of very traditional and established editing terms and it really didn’t make any sense and neither does it in this case either. I really like this keyboard and I’ll say it again that I think it’s pretty cool BMD put in the time and money to create such a tool dedicated to just the craft of editing. Only BMD would do such a thing as I’m sure many companies would see it as a gamble. Lightworks has had their Console as long as I remember but Lightworks never really took off outside of some dedicated Hollywood editors. Logic Keyboards makes a bunch of editing keyboard too but nothing as extreme as the Resolve Editor Keyboard. Well, maybe not every company but not every company would sell a $1,000 keyboard. Will it be successful? Time will tell. Will I want one when craft editing in DaVinci Resolve? Yep. I should add that many of the YouTubers and gamers who use Lightworks tend to just use the mouse and a few basic keyboard inputs, You don’t need the console or a controller to use Lightworks, although your editing speed shoots way up when you do. YouTubers and gamers using Lightworks? I don’t doubt there are some using Lightworks since it’s not expensive but can you point to documentation of any significant numbers of YouTubers and gamers using Lightworks to edit their video? I’ve seen a couple of FCP Legacy editors cutting with two hands on the keyboard but I’ve never seen an MC editor like that. I am actually pretty sure it is impossible to do any meaningful work in MC without a mouse. Wha???? Avid is the most capable NLE of being driven without a mouse. Good editors can cut on Media Composer with minimal use of the most. It’s be best one for that!